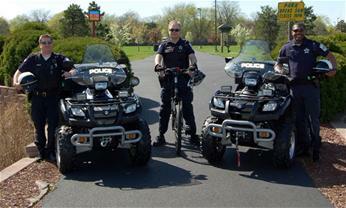 The Bicycle Patrol/ATV Unit is comprised of Officers that utilize alternative patrol techniques to address all types of criminal activity. • Patrol areas generally inaccessible to a patrol vehicle such as bicycle paths, jogging paths, parks, railroad easements, most places where a squad car cannot go. • Enhance the community policing efforts by promoting positive contacts with the public. • Augment the safety and overall coverage of the Village with a visible Police presence.